How much of a Gardener are you? Ok, weird question I know. I myself am not much of a gardener, I don’t know much about growing plants, last year I tried growing one in my room but due to the lack of an instruction booklet, I wasn’t very good. Not to mention my failures in the past trying to grow and look after Bonsai Trees. I am just generally bad at it; but how about you, what are you like? As I probably do not know who you are; you may have to just tell me in the comments, but if you are a talented gardener there are some kinds of plants you may want to avoid growing. Obviously there is such a thing as a Triffid; in which case you may want to give that one a miss. Though growing a Triffid is probably not all that a bad idea compared to growing a Biollante. Not there is anything bad in that either if you are talented enough to grow a Biollante; it’s just probably not a very good idea. Released in 1989 by Toho, directed by Kazuki Omori and produced by Shogo Tomiyama; Godzilla vs Biollante is the 17th film in the Godzilla series and the second film in the Heisei series following directly on from The Return of Godzilla released in 1984. This time around Godzilla returns to attack the good friendly people of Japan once again, this time however having his own body caught up in a large scientific conspiracy which ultimately leads onto the creation of a brand new and terrifying monster known as Biollante. This film is something of a one-off departure in the series as it refrains from the tried and tested but simple formula of Giant Monsters just fighting each other, and goes in to explore man’s desire to create and prolong life and what the consequences of such actions can be. Tokyo is in ruins in the wake of Godzilla’s attack in 1984. The city is near completely destroyed as crews commence the clean-up operation. On the site, a piece of Godzilla’s skin is discovered and stolen by a group of soldiers, who in turn are killed by an assassin known only as SSS9 (Brien Uhl). The assassin takes the skin sample to the Republic of Saradia, to deliver them to the institute of Science and Technology, whom the President wants to try and turn the country’s vast desert into greenery and end the Republic’s dependence on foreign imports. Dr. Genshiro Shiragami (Kôji Takahashi) and his daughter Erika (Yasuko Sawaguchi) are enlisted to work on the project, but the labs are bombed, and Erika is killed in the resulting explosion. 5 Years pass by; and the Volcano known as Mount Mihara begins to spew lava but not yet erupt. Young Psychic Miki Saegusa (Megumi Odaka) and head of the ESP Institute Asuka Okochi (Yoshiko Tanaka) work with young children who all one night have a dream of Godzilla returning. Lieutenant Goro Gondo (Tôru Minegishi) and Scientist Kazuhito Kirishima (Kunihiko Mitamura) head up a project to turn some Godzilla cells into Anti-Nuclear Energy Bacteria, or ‘ANEB’; in the hope of having a weapon to fight Godzilla with should he return. Gondo and Kazuhito try to get Dr. Shiragami’s help who has since returned to Japan. He agrees only if he could have access to some of the Godzilla Cells before they begin work. One night, Shiragami merges cells of a rose with Erika’s DNA in it, with the Godzilla Cells. With other bio companies and the Republic of Saradia still wanting access to the cells, the bio company known as Bio-Major send two agents to Japan to steal them back, while SSS9 follows them. The three agents break into Shiragami’s lab and get into a fire fight, until suddenly, a giant vine attacks them, killing one of them before the other 2 agents flee the scene. Gondo and Kazuhito arrive to find out what happened and question Shiragami’s work there. At Lake Ashinoko across from the Lab, a Giant plant emerges which Shiragami calls Biollante. He explains that the creature is made up from the Godzilla Cells, a Rose, and Erika’s Soul. Gondo and Kazuhito meanwhile receive word from the government that Bio Terrorists have placed explosives at the top of Mount Mihara, and will detonate them, thus releasing Godzilla unless the Godzilla cells are turned over to them. Kazuhito and Gondo head to the meeting point, but both them and the Bio-Major agents are interrupted by SSS9 who shoots the Bio Major agent and steals the Cells. Gondo and Kazuhito try to flick the switch to disarm the explosives, but the timer runs out, and Godzilla is freed. The army is called out, and the newly built Super-X2 is deployed to attack Godzilla directed by Major Sho Kuroki (Masanobu Takashima), but the attack is mostly a failure. Godzilla instinctively heads for Biollante, sensing something like him, and he quickly dispatches the creature. The military set up a plan to counter Godzilla, but accidently set up in a location opposite to where Godzilla decided to go. On his approach to Tsuruga, Miki; using her psychic powers gets up and close to him, successfully diverting him to Osaka instead. Another plan is launched to attack Godzilla with the ANEB. Gondo and his men deploy themselves inside Osaka’s Business district, while Major Sho leads the Super X2 in another confrontation. The attack is something of a success with some ANEB even getting inside Godzilla’s mouth, but Gondo is killed in the attack. Several hours pass by but Godzilla appears to be unaffected from the attack. Acknowledging that Godzilla might be a cold-blooded creature, Kazuhito decides that they should try to increase Godzilla’s temperature. Another attack plan is put in place to raise Godzilla’s body heat by using the M6000 T.C. System, a weaponised open air microwave like weapon. The plan doesn’t really appear to work, however suddenly; Biollante returns in a new form much larger than Godzilla and attacks him once again. After a prolonged battle, Godzilla is able to use his Deathray on Biollante once more, but then exhausted falls on the floor near the ocean. Biollante disintegrates and spores fly into space. Shiragami, watching the scene and having seen an image of Erika in the spores is shot dead by SSS9. Kazuhito chases after him, and after a small fight, SSS9 dies after stepping onto one of the microwave emitters from the M6000 T.C. System. Theorizing that everything is now OK, and that the ANEB has worked, Godzilla awakens, the sea water having cooled his body temperature down and then returns to the ocean. Godzilla vs Biollante does standout more than most Godzilla films when it comes to its narrative output as it tries to be different by sending more of a message out than simply putting monsters in a city sized wrestling ring. It’s a pity that such writing craftsman ship was sort of abandoned after Biollante because this films narrative makes the foundations for a classic piece of science fiction; in a literal form at least. The film begins with a reminder of what happened in the previous film and immediately turns to show the remaining devastation. It acts like not just a reminder but a tie-in and a clever opening as it uses this setting to begin what becomes one of the key plots; that of the Godzilla cells. This use of the opening though, allows the film to work and act as more of a direct sequel than just an ordinary singular sequel or spin-off. To this end we get a film that creates and carries on the themes and ideas it creates. It makes me think of the aftermath of the 911 attacks and the memorials built to remember what happened. In this case though (and about 12 years before the 911 attacks) we see how buildings destroyed and even imprinted by Godzilla are kept and turned into their own memorials. These scenes are very brief, but the idea and attention to detail in a fictional setting (especially after 911) is impressive and incredibly believable to say the least. This though acts as more of an introductory narrative to get the film started and set up the past for audience members. The real narrative begins during the post opening title credits as it starts the process of describing the benefits of the Godzilla Cells and then it evolves from there as to what they can do and how valuable they are. Another narrative that is explored briefly is that of detecting Godzilla’s return and the departments involved. From here we get two viewpoints. One of the ESP institute, and that of a small department run by Gondo. These two pretty much work in tandem from the word go. This leads to a couple of funny scenes, well one scene and an idea. The scene takes place when the psychic children have a dream, and when asked to draw what was in the dream, it’s sort of a laugh out loud moment when they all hold up pictures prominently featuring an image of Godzilla in them. The build up to the scene is the suggestion that something has gone wrong, but the delivery is excellent, especially when the pictures reveal what the issue is, and the idea that all the children draw the same thing. The other scene (well, more like an idea) is that of a government department run by Gondo whose sole responsibility is the handling and planning of affairs including the preparation of defences in case Godzilla returns. For some (or at least me), it would be something of a dream job, but for Gondo however, it is more of a burden (or maybe even some form of punishment), as given the department’s sole purpose relies on Godzilla actually being around; it’s more boring than exciting as Godzilla is currently buried in a volcano, nor is a current threat. A further narrative asset on to this comes in the form of the Godzilla Warning system which helps drive the plot forward to Godzilla’s eventual rampage. The idea though of such a department’s existence is rather clever and fun and one am surprised that doesn’t come up more often. It’s sort of like: imagine a country like the UK, or USA, or Russia, China, or any other country’s ministry of defence having a small office run by no more than 2 or 3 blokes whose sole responsibility it is to watch and plan for attacks from Giant Monsters, despite the grand highly likely possibility that it will never happen……….but then it does. These strong starting points help to deliver early on a very in-depth idea based plot; but where you find strengths, you are bound to find weaknesses. As the plot develops, there is constant mention of the country of Saradia. This works in tandem with the conspiracy and secret agent story about a terrorist Bio group who are the ones in the end who release Godzilla. That scene in the end is pretty fun and suggests more of an imagination from them in comparison to others in film. I mean what’s more creative than threatening a country with a Giant Monster? But the ever-increasing mentions of Saradia, plus the mingling with its agents (who sound more Greek than Middle Eastern if that was supposed to be the idea) is just silly. It does not really provide anything or benefit the film except for a minor piece of backstory. In the end, it simply provides a reason for the SSS9 agent to keep running around; who is somewhat of a good thing, I think. The thing is, this story gets a little tangled up within itself, and always finds a way to divert itself. It’s supposed to be about the ethics of biology and science, and how rare/valuable biological material can be used to great effect when used properly, but also how dangerous it can be when used wrongly, and the consequences of such actions. The main one being (or at least should be) Biollante. The Problem Biollante has is that despite being in the title, she is seen very little of. It’s similar to the argument ‘suggesting’ the lack of Godzilla in the 2014 film (although I disagree). In this case however I find the issue is that despite being on even terms with Godzilla in the film’s title; Biollante is not shown that often to really warrant her name in the title. In fairness though, her appearance is early on enough to really include her, but after a few short-lived scenes and a fight with Godzilla, she disappears for nearly an hour. From that point on it becomes more of a film about a nation’s attempts to defend itself from a fire breathing atomic tyrant. I’m not saying that is a bad thing necessarily. In fact given the lack of such content in comparison to other films in the series; this is a real standout: but it’s not what it’s supposed to be about! Eventually Biollante does return, but only engages Godzilla for less than 10 minutes, before disappearing and showing a rose in space; but what does this even mean? It’s pretty similar to both Godzilla vs Destoroyah and Godzilla vs Megaguirus in that both films, despite once again featuring in the title; both monsters are pretty much side-lined for an entirely different and possibly irrelevant plot and just become mentions: although this is not so much the case for Destoroyah as he has much greater part than the instances involving Biollante and Megaguirus. In the case of Biollante it feels more like there could have been more for and of her (in this film). A point I feel brings us on quite nicely to talking about the film’s cast. Now I will attempt to do this bit quickly as I have still a lot more to talk about (not to mention a 100 metre tall lizard). The cast of characters is quite a nice build of memorable characters whether they be tertiary, secondary or primary, with all of them playing an interesting but still memorable parts, but of course you have some who are not as big as others. These are not necessarily bad or good, more like they have more a part compared to others, when you want them to have more of a part than others. Biollante does mark something of a start in the series for some tertiary characters who would become a mainstay for the series for many years to come, such as one Japanese Military official played by Koichi Ueda. These kinds of parts are usually tertiary, and even if portraying different characters in later films, they begin to get really recognisable due to the amount of times they are cast in small or even larger parts. Some of these occasions they can become rather annoying, but once in a while, they can do something better, sometimes perfectly. There are also other instances as well of characters from other films, mainly later in the series that turn up, and you instantly recognise them, as them. In this case we have one of the Super X2 pilots (Kosuke Toyohara) who would later appear in the lead human role in the film following on from this one (Godzilla vs King Ghidorah). Alongside him in the Super X2 role (sort of off the point topic I know), there is another character (Kyôka Suzuki), this time not a pilot, but featured well in the dynamic of the two roles being shown. Ok, they’re not shown in great depth compared to all the other characters, but they’re still memorable to the point they deserve a mention. There is also the case of a cameo appearance from Demon Kakka in a small role, but I had not heard of him until I had watched this film a few times, noticed him in a 10 second scene, and then looked him up. It’s a nice representation on modern culture of the time, but also a nice funny moment, especially given his appearance and what he says just after Godzilla is released. Now onto the primary cast. Kazuhito does have the sort of lead human role, but I find him rather bland and boring. Alright it’s not a great shout out to a strong cast, but I just have no feeling toward him or his character, and just feel like he is just in the way. On a similar case you have a character like Major Sho. He is presented like a sort of rogue or cool military commander, I just feel it doesn’t work. He has his moments and becomes something of a secondary hero saving Katsuhiro’s life at the end, plus his moments directing a counterattack are ok, plus the other moments where he is in more a professional capacity but still military, they are ok. I just don’t think he really delivers anything to benefit the film, he is less in the way than Katsuhiro, but I don’t get him. Next to them you then get leader characters, leaders and more mature characters like Gondo and Shiragami. Shiragami for instance plays something of a tragic version of Doctor Frankenstein. He creates a monster, but for a tragic reason, which then just causes more problems. It’s the sort of situation that is understandable, but goes against ethics. The character that loses someone, wants to bring them back and put things right, but does not have the skills. Is then given an opportunity but the end result is not what he really wanted, and chaos lets loose. He then becomes something of a standing assistant for the rest of the film, which is something of a shame, but he delivers it really strong, and in the end becomes the tragic sacrifice presenting something, presenting an idea. Maybe as to say as it started with him, it had to end with him, or that he succeeds in keeping his daughters soul, spirit alive, but he dies to accomplish it. I don’t really know, I am just guessing here, but something along those lines maybe. Despite his tragedy though, he is a nice enjoyable character and less of a scientific character that you usually get in monster films. Not of someone to explain what is going on, but maybe more like Serizawa from the 1954 film, someone who creates, does something else, but that something is questionable. On an opposite but equally enjoyable side we have someone like Gondo. Now I have already said a lot so I’ll (try to) keep it brief. He is a more witty character than a serious one in comparison to someone like Shiragami. He is in charge of a division of which he is the sole employee, he finds a way out and gets involved in a more important task with Katsuhiro and becomes a very respected and well thought about character. This level of development plus his level of character and on-screen time make his death more of a powerful one. It’s not just some character dying; it’s one you’ve come to care about. When he does die though, he goes in a great scene going near head to head with Godzilla, not many people can say they have done that. Asuka meanwhile who plays the female love interest to him is far more interesting and has real scene dynamic with all characters involved plus delivers power; providing reason to being in the scene. She is more of a leader than a supporter, and the film’s strongest form of human reasoning, even if she spends the third act as more of a questioner than an answerer. Her scenes with Miki (speaking of which) are a bonus. This is the first time Miki is seen in the film series, a character who would become the only mainstay of the Heisei series from this point on, and one of the longest running characters in the whole film series to date. This time around though, we finally get an introduction. Ok, I say finally, that is mostly due to how long it took fort me to see this film, due to release issues, but that time has passed so let’s move on. Now, she has reason and purpose rather than being someone included with no backstory until discovered, now she has been introduced. Miki this time is a very young girl, still touching teenage-hood, but her strength is already on show. She is mostly an informer to the situation and mostly works on a co-dynamic role assisting Asuka. There is actually more of Miki I feel in this film than others. Not in number of appearances, but more in who she is and what she can do. She plays more of an interesting part than being a background assist. It just feels like this was a film designed more for her character her role, and the others just included her, and it feels like something of a shame now, because it works. Right, I think that’s enough people talk, let’s talk MONSTERS! This film is one of those even rarer occurrences in recent films to feature new stuff, and in this case, we have a New Monster. Biollante (Masashi Takegumi) is very different to other Monsters, not saying that all monsters are the same. I meant more as in while all the others have something of a clean crisp look; Biollante is more of an abomination. Yes she is a plant, and begins looking like a giant rose with giant leaves and vines. Then transforms into something very large, even larger than Godzilla. Something with a huge crocodile like mouth and lots of sharp teeth (although those same teeth can be seen to appear in rose form, with is also very scary but still grotesque). Biollante is a scary creature, but her sweet cries, almost wisp sounds produce something else, suggesting something trapped inside the body of a monster. Suggesting possibly that Erika does live inside, but is crying for what has become of her, that she is no longer who she was. Biollante as a design is fantastic, and the concepts regarding her appearance and abilities including details such as spores, or the bodily moving mass despite the lack of Legs really produces a sight to behold. Here we have a creature that is more than a match for Godzilla, but not necessarily one you can use all the time. Biollante could make a return, but would require a well thought out plot like this to happen. For now at least, we have an incredible new monster on show, presented in a horrifyingly near realistic interpretation that will continue to scare and spook all those who want to give it a go, until we see her again. Which brings us nicely round to Godzilla. Yet another appearance for Godzilla (Kenpachirô Satsuma), but as that is who the films are about I suppose we can allow it. Godzilla is back in a similar role to those he had when he left in the 1970’s. Remembering of course that the previous film was more about him on the loose than fighting another monster, here he is back to fight monsters. This time though he is once again a (please excuse my language) ‘Badass Villain’. He is no longer out to save the world, but as the frightening force of nature who symbolises the destructive might of Nuclear Weapons on the world who made them, and as mother nature’s Punisher come to, well, punish. Yes, he is back and not happy. 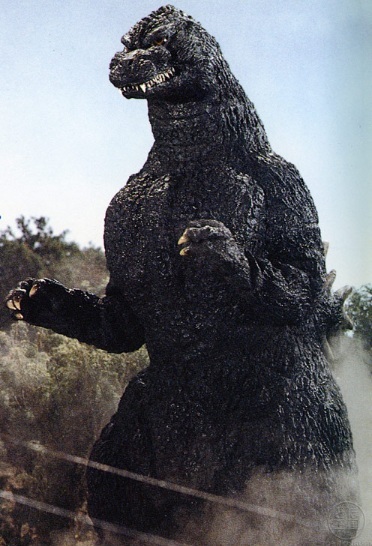 Setting up his role in the previous film and mentioning the previous film’s events, Godzilla of course starts off more as an idea, a non-existent threat, one who is there; but is not coming. This idea builds until his release from volcanic imprisonment. From there it is back to the city crushing, fire breathing leviathan we have all come to love so much. He maybe a baddy but we do love him in our own quirky way (right?). This time around though he has other quirky little bits we have not seen him do before, like get up close and personal with some characters, even to sneaking up on people like Gondo. Before he would never do something like that, just ignore it, but now, he is doing new scary things. His appearance has some issues I think, from an angle and to the sides he looks pretty good, like he used too, but now even more terrifying, but from the front, it sort of reminds me of King Kong vs Godzilla, where a direct front view looks rather flat, and like an entirely different monster. Apart from that though, it’s him. I don’t exactly know what to say other than to point out cool new traits in him that stands out more from what there are normally about him; I mentioned his look too, but other than that it’s the Godzilla we all love (again?). Visually Striking! That is how I can best use to describe how this film is presented. The film contains a lot of visually striking moments, more than any other of the series films to date. Such scenes range from important narrative to just general background shots. Mount Mihara for instance features a lot early on in the film as that is where Godzilla is currently residing. Most of this coverage though is in the form of volcanic activity, but one sweet moment lies early on when Asuka and Kazuhito are talking in the foreground, and the active volcano of Mt. Mihara can be seen in the distance, a ring of red at the top, and the sound of the activity in the distance. I like that shot. But it’s not all reserved for Mount Mihara however. Other shots of spectacular note include the beautiful business centre of Osaka just before it gets pulverized, the area outside and inside Tower 2, the platform Miki stands on as well as when Godzilla is within reach, Godzilla’s lifeless carcass near the road, Godzilla sneaking up on Gondo, the many showcasing’s of digital battlefield mapping, the stormy weather near the film’s conclusion, the final battle seen on the hill-side, the military manoeuvres, the ruined remains of Tokyo after Godzilla’s rampage from the previous film and not forgetting of course, Godzilla’s glorious return from the Volcano he was put into, walking out in his own time to preserve the majesty of his reappearance. You see, I can talk about Special Effects, describing the uses of miniature sets and suits, but as we have already come to know these things, how am I supposed to rehash these every time and retain interest. On this occasion you see however, that it’s not the effects that stand out most here, but the visually striking shots of the world that becomes the battleground here, and those remain with me most than most things about this film. It is such a well-used piece of filmmaking, and those kinds of things should not be wasted by the audience, nor be forgotten in an analytic review. It’s not just the imagery that’s memorable either, as the soundtrack can say one or two things about that. Composed this time round by Koichi Sugiyama with his one and only entry into the Godzilla series; where he produces something that could be thought of as a black sheep to the soundtrack collection. Sugiyama produces a soundtrack that is a mix of the wonderful to the bizarre, the strange to the ridiculous, and the unique to the downright silly but overall has this relatively light feel to them. There is hardly a dark or heavy tune in there with the one main exception being the opening credits which is more of the original Dark Godzilla theme combined early on with this sort of repeating drum snare or even rasp that just captures your attention even before you see the head of the film’s lead Antagonist. There is a feel of super hero type stuff in this soundtrack with those feelings coming out at times such as when the Super X2 comes out to play or when the countdown to Godzilla’s return comes to light. This piece in certain however also contains something of a possible trademark to his work on this film as it sort of diverts, changing feel and tune in a different direction. Yes this moment does sound a bit silly and a bit caper-y, but does ramp up the tension (although when it does change note it sounds very similar to the soundtrack for Airplane). Yes the soundtrack does have its silly points such as the Saradia theme tune, but generally, most of the soundtrack is rather fun and light and enjoyable to its overall core. Two pieces though that really stand out more than most are two points where the music is different, not just generally, but completely in comparison to the rest of the soundtrack. The first of these is the Bio Wars tune of which there are 2 versions. This I feel is like the filmmakers trying to include a sort of ultra-new wave Bond theme at a time when the Bond series was on Hiatus. It feels really sort of future spy like, I don’t know how best to describe that other than “listen to the guitar.” It’s a nice fun piece which adds a level of mystery and conspiracy, especially to scenes when including SSS9 in the middle and end. The other occasion though has nothing to do with the composer. Much like the inclusion of a popular figure like Demon Kakka earlier on, the film tries to add a piece of popular music briefly. It adds a level of confusion as to what is going on, as it is used during one of the moments when you see through Godzilla’s eyes like you do in Jaws when he comes to the surface. It cuts in and plays. It’s different and rather fun, before getting cut off completely to feature a local rock concert being put on hold because of Godzilla being close by. It’s a nice fun little tune from Yuki Saito called Into A Dream. It’s similar I find to the inclusion of Claude Francois‘s Stop Au Nom De L’amour in X-Men: Days of Future Past as it enriches the film that little bit more in atmosphere, if only very briefly. Godzilla vs Biollante is a very different film to the rest of the films in a series that is currently 30 strong (31 in July). It’s different in its presentation. It has great narratives relatively unexplored to this point and since. It features visually striking shots of what an Amazing country Japan is (one of which I still want and need to visit). It incorporates interesting characters, not forgetting terrific performances from both Godzilla and a brand new monster. It hosts a soundtrack that is relatively light, but also spectacularly fun to listen to. It is a very different film indeed; one made with such careful attention and craftsmanship and in the end produces one of the series most stand out and enjoyable films. While it may not be the strongest, most standout or best film in the series (depending on who you ask); what this film does provide is just a stellar excellence and an exceptional experience.